I have been a huge John Carpenter fan for more years than I can remember and, although he didn’t direct this film, he was heavily involved. David Gordon Green believes that if you’re going to helm a sequel from a well-known franchise it is only right and proper to consult the original director. It was decided Halloween (2018) would be a direct follow-on from Carpenter’s 1978 classic (albeit set 40 years down the line). 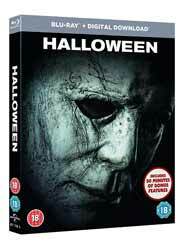 This meant all the existing sequels and their corresponding continuity would be dropped – including the Carpenter-scripted Halloween II (Carpenter never liked his own idea of making Michael Myers the brother of Laurie Strode in the first sequel, and the ‘rumour’ is actively denounced in this film), Halloween H20, which starred Jamie Lee Curtis, and the disappointingly lacklustre Rob Zombie remakes. This is a big gamble to take but, ultimately, it works. One of the major actions Carpenter took was to bring in Nick Castle, who played Myers/The Shape in the original; his reasoning being that even with a mask people can detect alternative body language and movements. It would be made plain this was the same person, rather than a cipher. It proved to be a masterstroke, as you really can tell the difference. Some of the sequels had Myers too stiff and almost robotic. Another major contribution John Carpenter made was to compose the soundtrack (with son Cody). I not only have all of his films but his film scores, too. This one is great, with a modern slant on his early compositions and added electric guitar courtesy of Daniel Davies. I soaked-up all the music when I saw this film at the cinema, until the lights were back on and I was being willed by the usher to leave. I pre-ordered the official soundtrack and it took pride of place with the others. The original Halloween theme that we all know and love is present, with a plethora of new material to run a chill down the spine. The closing credits piece is excellent; it’s Halloween, Jim, but not as we know it! There are some nice moments amongst the gruesome set-pieces. In the car which discovers the crashed prison bus is a father and son. The boy has been on a series of hunting weekends primarily to please his dad, but he tries to explain that his true calling is dancing. The friendly relationship between the babysitter and little boy is priceless, as they attempt to get one over on each other. In fact, they remind me of Gary Coleman and Dana Plato, who played Arnold and Kimberly in Diff’rent Strokes. There are some nice tributes to the late Donald Pleasence with several references, voice recordings and a voice-alike. As far as Michael Myers goes, a victim is covered in a ghost-like sheet, and when he walks through a house we hear a baby crying. This is a good way of making every viewer collectively hold their breath, as Myers glances down at the cot before moving on. There is plenty more to be said about this film, but let me just say in conclusion: This film is an exciting and satisfying end to the franchise, which links directly to the first movie. There are countless tributes to the classic original, with many shots mirrored. For example, Laurie goes over a balcony this time; trick and treat kids literally run into Michael, exactly as the boy does in the original; Laurie’s granddaughter runs down the street screaming for help; Michael tilts his head quizzically after a kill; and Laurie stands across the road, as Michael had done so in the first film. There is also some very nice camera work – particularly the sequence wherein the masked Myers looks in through someone’s window and is then seen to approach the occupant quickly from behind for a kill. The reflection in the glass is an example of professional direction of photography, hinting at the masterful lighting in the 1978 version. Of course, Carpenter’s original was hugely stylish; all about menace, with the kills never lingered upon, so that people thought they were seeing more than they actually did. Things have moved on, however, and viewers expect to see inventive kills from one of the most famous fictional serial killers in film history. Extras include: Deleted & Extended Scenes (eight scenes), Back in Haddonfield: Making Halloween, The Original Scream Queen (Jamie Lee Curtis), The Sound of Fear (the music), Journey of the Mask (updating Myers and the mask), The Legacy of Halloween. For me, there is very little additional material for the Halloween enthusiast – of which there are many. There are only around 30 minutes of special features, and the deleted and extended scenes take up most of that. There must be more behind-the-scenes stuff, which makes me suspect this is being held onto for a future special edition. These featurettes could well have been strung together into the same documentary and it would still feel infuriatingly short. For anyone like me who can’t get enough of John Carpenter, the gathering of him, Curtis, director and producer warrants many more fascinating facts. As for The Sound of Fear, you can see and hear the enthusiasm and joy of Carpenter, son Cody and guitarist Daniel Davies working on the music. But it’s all over little after it begins. I would love to have seen a forty-minute fly-on-the-wall documentary of them in the studio. However, I won’t let this prevent me from recommending what is essentially a thoroughly entertaining horror film.